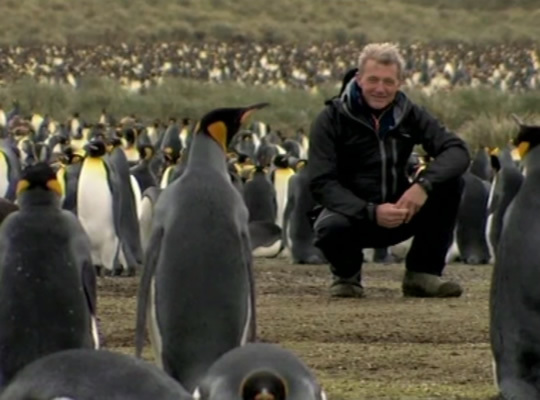 Paul headed South again soon for his 14th Antarctic season in support of science. 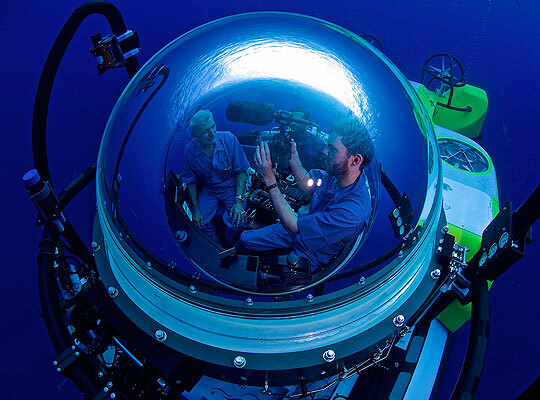 He will be working with his science colleagues from Scripps at University of California USA and the National Institute of Water and Atmospheric Research NZ on a National Science Foundation funded climate change project. The team will meet in Christchuch NZ and fly to the USAP research station, McMurdo, where they prepare the science equipment, skidoos, sledges and camping gear. They are then deployed by helicopter into the most extreme desert on Earth, the Dry Valleys where they will work for 8 weeks. 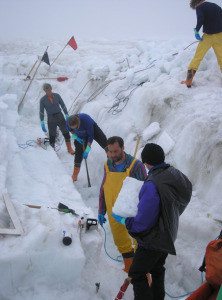 The first season (2009/10) the main work was taking short ice cores down to 5m, with a hand auger, to take back to the lab and analyse for oxygen isotopes of atmospheric oxygen. This gave us the age of the ice and the right location for our large sampling equipment and ice laboratory. Last year (2010/11) we returned to the Taylor Glacier with the full sampling equipment we have been using in Pakitsoq Greenland. And this year (2011/12) our last season on the project, will involve continued large volumne ice coring and ancient air collection. 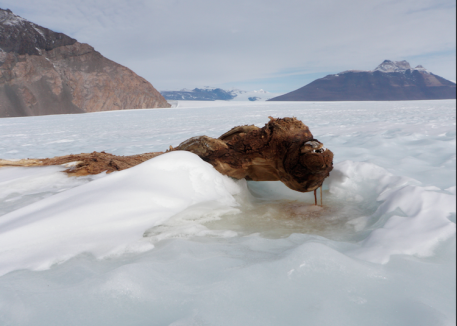 This project will sample ice for gas analyses from Taylor Glacier, in the Dry Valleys near McMurdo Station, to develop a precise chronology of the exposed ice in the 20-km-long ablation zone. Prior work has shown that this ablation zone contains a unique stratigraphically-ordered sequence of ice at the surface dating from approximately 8,000 to 70,000 years ago, that promises a "horizontal ice core" for easily-accessed large-volume samples of the past atmosphere and microparticles that are currently not available from ice cores. The initial scientific objective is to test the hypothesis that methane clathrates destabilized at times of abrupt warming during the last deglaciation, causing the observed abrupt increases in atmospheric methane concentrations known from prior ice core records. 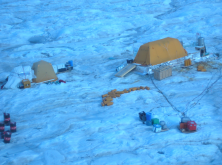 The hypothesis will be tested by measuring carbon-14 in large-volume samples of ancient air obtained from Taylor Glacier (typically 100 liters of air), which is not possible from ice cores. This information will inform the future stability of methane clathrates in a human-warmed world, and the precise chronology for the horizontal ice core will permit a wide variety of future projects on other trace gases and particles. The project will also test the hypothesis that C-14 methane is produced cosmogenically in ablating ice and quantify cosmogenic 14C production rates. The 2009/10 field season was 1.5 months long. Helicopter support serviced a 5-person field camp on Taylor Glacier, and several sampling trips. The primary mode of travel on the glacier was snowmobile. A 3” eclipse drill was used to collect ice samples which were returned to the US and NZ. Last year, 2010/11, the field season was 2 months long and the team was 9 people. 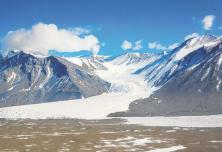 Base-camp, the laboratory and ice core drilling camp were established on the Taylor Glacier. Large ice cores, 25cm diameter, were drilled from 12 metres depth and melted in the lab melter and the gases extracted. Small samples of the gas were analysed in the lab and the main, large volume gas samples returned to the US and NZ. 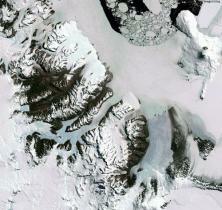 The Dry Valleys of Antarctica is the driest place on Earth. In Antarctica, a series of parallel valleys lie between the Ross Sea and the East Antarctic Ice Sheet. 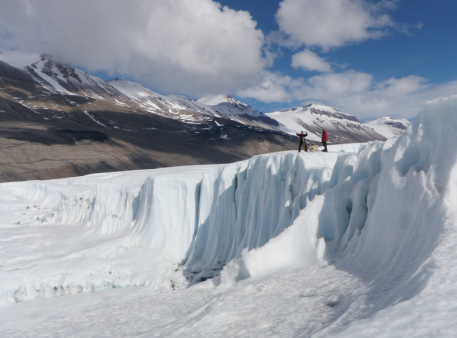 Known as the Dry Valleys, they are swept free of snow by nearly relentless katabatic winds—cold, dry air that rolls downhill toward the sea from the high altitudes of the ice sheet. 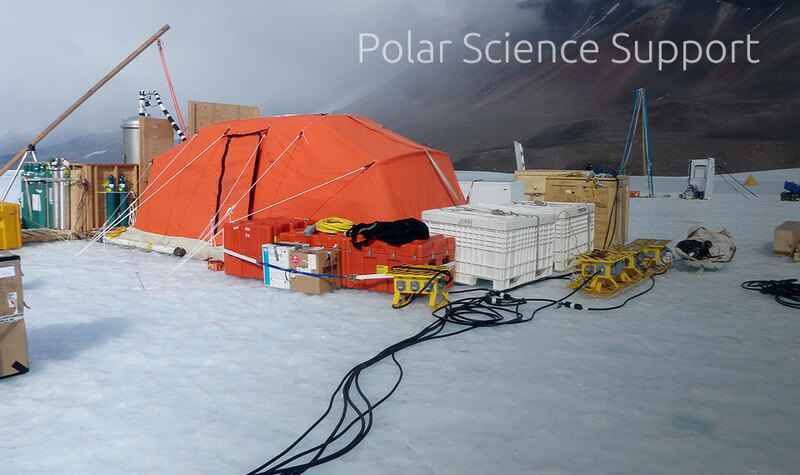 Paul supports science in the world's most challenging and remote locations. For more information contact Paul.